Back in 2015, I reviewed Robert Arthur's The Secret of Skeleton Island (1966), an early title from the prodigious The Three Investigator series, which I read purely out of curiosity, but this excursion sparked an interest within me for juvenile mysteries and have since gone through an entire pile of them – comprising of such writers as William Arden, Bruce Campbell, Manly Wade Wellman and Capwell Wyckoff. JJ of The Invisible Event joined me and has since uncovered many interesting titles. One of his discoveries, in particularly, attracted my attention. Enid Blyton's The Mystery of the Invisible Thief (1950) is the eight book in The Five Find-Outers series, which began with The Mystery of the Burnt Cottage (1943) and ended with The Mystery of the Banshee Towers (1961), described by JJ as "classically-styled a piece of Genius Amateur Detection as you can get." On top of that, the plot partly revolves around "a legit impossible disappearance." So it was fast-tracked to my to-be-read pile. And honestly, it didn't disappoint. The head of The Five Find-Outers and Dog, as they're officially known, is Frederick Algernon Trotteville, simply called Fatty by everyone, who's the brains of the team and has a talent for disguises and imitations – making him the most well-rounded character of the group. Fatty somewhat reminded me of Jupiter Jones from The Three Investigators. Larry, Daisy, Pip and Bets are, as JJ pointed out, just sort of there, but lacked (here at least) personalities and their characters, as well as their roles in the story, were easily interchangeable. Lastly, the group is rounded out by Fatty's jet-black Scottish Terrier, Buster. When the series began, the age-rage of the group was 8-13 years, but, from what I understood, they age (slightly) through out the series. They live in the fictitious village of Peterswood, a quiet country place, where, according to Constable Tonks, "the only thing that happens is a dog that chases sheep" or "a man that doesn't buy his wireless license." Or so he thinks. Inspector Jenks knew better and is "a great friend” of The Find-Outers, because of "the many curious mysteries they had solved" during their school holidays in Peterswood. 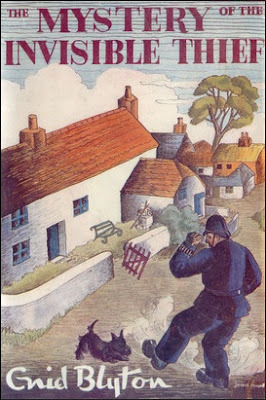 However, the village policeman, Constable Theophilus Goon, refers to the children as toads or pests and always suspects them, especially Fatty, of playing dirty tricks on him – which is usually the only time when he's right. The interplay between the five children and Goon kind of reminded me of The Exploits of Quick and Flupke. So there you have the groundwork for a series that ran for nearly twenty years and fifteen novels, but let's take a look at the title that JJ called "an unexpected delight." The Mystery of the Invisible Thief takes place in the middle of summer holiday and the Five Find-Outers have nothing to find out, nothing to solve and only four weeks left in the holiday. Buster is terribly close to overheating and their old nemesis, Constable Goon, is temporarily away on "some kind of refresher course." So it looks to be a hot, uneventful holiday when, all of sudden, Inspector Jenks is called to Norton House, in Peterswood, where a daylight burglary has taken place. And the intruder appears to have vanished into thin air. Jinny, the housekeeper, was alone at Norton House and half-asleep-like with her knitting work on her knees when "a sort of thudding noise" in the garden startled her. This was followed by a quickly stifled cough upstairs. Jinny notices that the gardener's ladder was standing underneath one of the windows outside and, as she was standing in the hallway of the house, also had an excellent view of the stairs, but nobody came down from either side and, when help arrived, nobody was found upstairs – all of the escape routes were eliminated as the windows were either securely closed or looked out over a dangerous, nearly fatal drop. So how did the burglar escaped from the house without being seen or caught? Well, the clues, red herrings and red herrings that become clues once you know they're red herrings are indeed something to behold! The burglar left behind several large glove-and boot-prints, indicating a very large man, while outside in the garden a curious print-mark was found in the soil outside. A large, roundish mark with criss-cross lines showing here and there. These clues and red herrings, in combination with the details of the burglary and statements of suspects, will immediately spell out the entire solution to older, more experienced mystery readers, but poses a genuine and fair challenge to its intended audience. 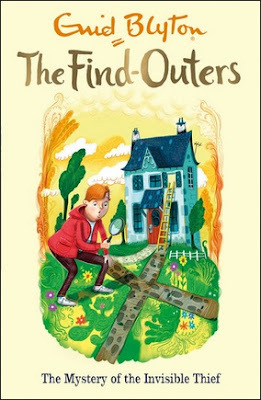 Everything fits together logically and encourages its young readers to take all of "the different clues" and fit them together "like a jigsaw puzzle" in order to create "a definite picture of the thief," which not only makes this a clever and entertaining detective story, but perhaps even educational one – as it encourages logical thinking and reasoning. All the clues are there and, for those who lagged behind, a late chapter is included in which Pip plays a trick on Fatty. A trick, or rather joke, that helps everyone understand how to properly view all of the clues. This should help everyone to see who was responsible and how the impossible disappearance was accomplished. Absolutely marvelous! The locked room trick is not exactly, what you call, an original one, but what made it more than acceptable is how well the locked room was presented and handled. And further improved by the first-class clueing! Anyway, the story between the opening and closing chapters contains a few more burglaries, but the high-light of these parts, besides the excellent clueing, is the parallel investigations of the five and Constable Goon. Fatty and Goon are even engaged in a battle-of-disguises, which the latter hopelessly lose. Despite getting free reign to chase a burglar, Blyton still portrayed The Five Find-Outers as genuine children on an adventure during their school holiday. Even after JJ's glowing review, this made for a leisure, but excellent, summer reading. I'll never cease to be amazed at how many locked room and impossible crime stories there are to be found in the juvenile corner of the genre, which tend to be pretty decent tricks or even turn out to be very innovative for the time, but readers with a special interest in locked room fiction are barely aware of them – none of them made it into Robert Adey's Locked Room Murders (1991). So, perhaps, it would be a good idea if someone, like John Pugmire's Locked Room International, published an omnibus edition of some of these relatively short juvenile locked room novels. There are more than enough potential candidates to fill such an omnibus edition: Blyton's The Mystery of the Invisible Thief, Bruce Campbell's The Clue of the Phantom Car (1953), Robert Arthur's The Mystery of the Whispering Mummy (1965) and William Arden's The Mystery of the Shrinking House (1972). You could pepper such a collection with one or two short stories. Theodore Roscoe's "I Was the Kid With the Drum" (Four Corners, 2015) and John Russell Fearn's "The Thief of Claygate Farm" (The Haunted Gallery, 2011) immediately come to mind, but JJ also found a number of modern-day short stories in a post titled "Trifecta Perfecta – A Trio of Locked Room Riddles for Younger Readers." I think these titles would make for a great omnibus and introduce locked room readers to a side of the impossible crime genre they're probably not too familiar with. All in all, The Mystery of the Invisible Thief proved to be a minor gem of a detective story and is not only, plot-wise, one of the better juvenile mysteries I have read to date, but could easily serve as a textbook for mystery writers on how to properly handle clues and red herrings. Because this is what John Dickson Carr meant when he said that a good detective story has a ladder of evidence, or a pattern of evidence, which, when properly applied, can fool even the experienced reader – until, in the blaze of the surprise ending, he sees the whole pattern. Sure, the difficulty setting here was on easy, but an intelligent writer/plotter should have no problem in applying this technique, beautifully put on display here, to an adult audience. Highly recommended! Yes, but WHERE DO YOU FIND THESE? My library system, which is a vast one, has none of these nor anything by the author. It's rare any even show up on ABE. I've had to give up on these and most other juvenile series for that reason. Hodder Childrens Books reprinted The Mystery of the Invisible Thief in paperback and made it available as an ebook (see second cover). I looked on ABE for you and it returned five pages worth of results when searching for the book-title. So you should be able to get it relatively cheap and easy. I hope this helped. I'd be delighted that you ejoyed this so much, but it's a complete no-brainer for me: the detection is amazingly solid, the clues strong and clear, and the impossibility legit and -- as you say -- a great introduction to the concepts and rigours of applying logic to the solution of this type of story. I am astounded that I only stumbled across this series by accident, and that it's not more widely discussed. That'll partly be down to the perception of Blyton as the author of more adventure-y tales (written in far grater volume, so it makes sense). She was a GAD fan at heart, and I'm going to bet she read all the classics in her time. I think it's a pretty safe bet to say Blyton probably read some Carr, Christie or Chesterton. Seriously, my initial perception of Blyton was very different from what I found here and likely would never have read it had it not been for your review. You made a truly serendipitous discovery with this one. I really think The Mystery of the Invisible Thief should be used as a textbook for writers to teach them how to structure a logical, properly clued detective novel with solid detective work. 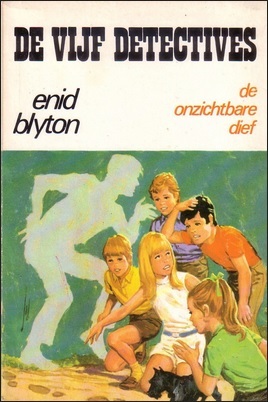 Anyway, I'm still amazed that from all the juvenile mysteries, read between the two of us, Blyton delivered one of the strongest titles, so far. I bought a boxset of this series and read the first in the series, The Mystery of the Burning Cottage, recently, and it's just as strong in the detection and classical GAD misdirection. 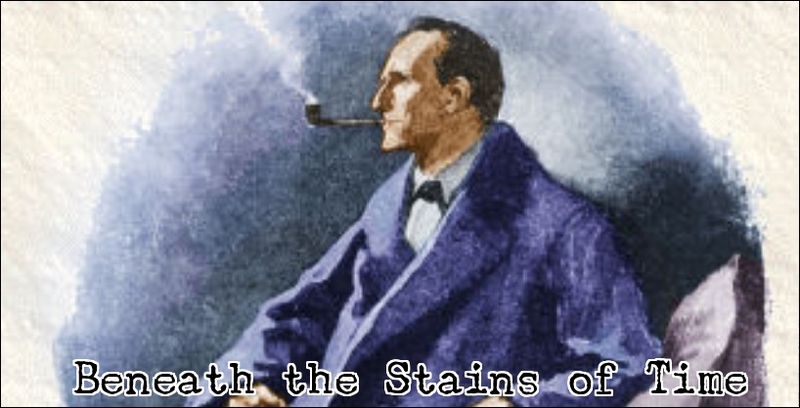 There's even a wonderful piece of "we're so determined to see everything as a clue that we're going to obsess over this detail which turns out to have nothing to do with it" -- a conceit which is under-explored in the bscure-clue heavy annals of most detective fiction, and a lovely little joke on the process of detection. I don't see the Crofts/Rhode influence. The identity of thief and how he moved around the village reminded me of Chesterton and the roundish, criss-cross imprint in the soil is one of those unusual clues that Carr would throw in a story (i.e. the red sand in Death Turns the Table). Blyton is really going to end up as our favorite juvenile mystery writer, isn't she? I thought it would be hard for anyone to beat Robert Arthur, Bruce Campbell and William Arden, least of all Blyton, but she's getting there. Well, I guess I better start hunting down some more Find-Outers novels. The Rhodes/Crofts connection comes out more in Burnt Cottage, I feel. Might just be that one book, but the rigour of it is startling. Glad to see you enjoyed it so much. The Five Find-Outers are probably directed to somewhat younger children than other Blyton adventure/mystery series (with the exception of the Secret Seven stories), which is why I prefer them - and something like The Three Investigators - a bit before this series. But that is not to say that I dislike them in any way - they are great mystery reads for younger kids, say between eight and eleven? Absolutely. These are great reads for children of that age group, but, as said above, the dedication to plot and fair play also made this book a joy to read for older, more dedicated mystery readers. Once again, it can easily be used as textbook for writers to show them how a detective novel ought to be structured and clued. It has something for everyone who loves the detective genre. I loved these books as a kid... This is a good nudge to revisit them, thank you. You're welcome, Fleur. I hope they'll stand up to re-reading for you.